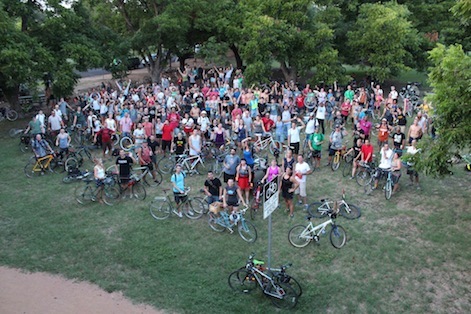 By Brandon WatsonNaturally, when Comanche documentary filmmaker Julianna Brannum voiced concern about Social Cycling Austin's November theme for their monthly Thursday Night Social Ride, the reception wasn't exactly warm. Within minutes, the Facebook comments devolved into a pile on against Ms. Brannum. The theme, "Indians and Pilgrims," is helpfully annotated with the suggestion to "bring blankets." In the occasionally brisk Austin autumn, that may be taken as a helpful reminder to be prepared for colder weather. Or to the more historically inclined, it could be taken as a reference to the ignoble Siege on Fort Pitt, where British soldiers attempted to drive back an American Indian rebellion with smallpox infected blankets. Stop being so sensitive, folks. It's only genocide.Apparently a huge flame war ensued. This was the eventual outcome:Notably, this isn't the first time Social Cycling Austin landed on a sketchy theme. Their April 2010 theme was "The Haaaay Ride," "hilariously" cashing in on Brokeback Mountain. Still, it does not look like Brannum's objections will have any sway. When asked for comment, one of the organizers, Keith Byrd, dismissed the controversy. "Not much to say. We've done this bike ride on Thanksgiving for years now. It's a small bike ride with friends that is about fellowship and pretty much looks like what goes on in practically every elementary school thanksgiving pageant across the country, but with bikes. I'm surprised this is news." UPDATE: Social Cycling Austin has changed the theme of the November ride.Comment: Considering this item was posted December 13, I'm not sure why they're talking about a Thanksgiving ride as if it's upcoming. To make the obvious point yet again, you wouldn't hold an event with the theme "_______ and Blacks" or "_______ and Latinos." Most people understand that you're not supposed to dress up as members of another race. Then why do people think it's okay to dress up as Indians? Indians are a large group of diverse peoples and cultures, not a stereotypical Halloween costume. For more on "Pilgrims and Indians" events, see Thanksgiving Pub Crawls in Indian Costumes and "Colonial Bros and Nava-Hos" Frat Party.